With Epoch marking a bold new beginning for Bernice Summerfield and eventually resolving the enigma that was Year Zero while introducing the captivating new companion Ruth, Road Trip sees the famed archaeologist continuing with her search for Peter as she tries to find her way to the world of Legion mentioned in Irving Braxiatel’s mysterious message. 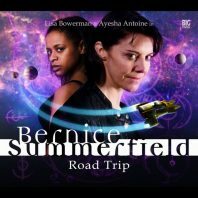 Beginning Road Trip is ‘Brand Management’ by Christopher Cooper with Bernice turning up at the wrong place at the wrong time as the people of Lyndyasz are celebrating their most important festival on the thirteenth day of the thirteenth month under the ruling eye of the Dominicci Corporation. Quite wonderfully, Bernice has managed to upset norms even while in suspended animation following the end of Epoch, and the Dominicci family has taken her name and appearance to fashion her into a sort of deity to further their own aims. More intriguingly yet, this is a society that worships a different deity seemingly every week, parodying commercialism excellently as the most popular and well-marketed ones remain the trendy craze. Indeed, the Dominiccis acquiring other peoples’ icons and rebranding them across the universe is a unique malevolent motivation that strikes at the heart of religion as well, and the speed with which rumours can spread about the veracity of deities even as people abhor the prospect of one being proven false offers a smart look at this world that mirrors current society well and provides a fitting if ultimately fairly easy means of resolution for Bernice to pursue. Lisa Bowerman and Ayesha Antoine formed an immediate chemistry in Epoch, and the two are gratefully reunited early on after their previous adventure seemingly saw them part ways for good. Ruth, of course, has lost her true identity due to the Epoch’s actions, and Bernice provides the one source of stability and familiarity for her in this universe, leading her to play to Bernice’s inquisitiveness by advertising her as some sort of celebrity in order to draw her attention to this world she has made her home. It’s equally telling just how unable both characters are to accept the apparent death of the other as events progress and turn more dangerous with the Dominicci plan about to be revealed, further bolstering the bond that this intrepid duo has formed over such a short period of time. ‘Brand Management’ is relatively light on plot by the time the resolution rolls around, but it’s nonetheless filled with strong ideas and presents some excellent character development for both leads, and this story that is unafraid to poke fun at the franchise’s past offers an enjoyable if ultimately fairly inconsequential opener that establishes the new dynamic with Legion in Bernice’s sights. In ‘Bad Habits’ by Simon Barnard and Paul Morris, the newest initiate into the Order of Saint Celestion, Sister Bernice, has devotedly undertaken a pilgrimage to the Saint’s birth planet of Agora. Of course, Sister Bernice is no such thing, and she furtively takes interest in an archaeological search for the lost tomb of the Saint as she seeks an ancient relic that will point her towards Legion. As religion and science enmesh with Bernice assuming two identities, her refusal to take a demotion while assuming the identity of dendrochronologist Professor Hare leads to awkward moments when first she must explain Hare’s apparent gender change and later when she must wear a mask and claim to be an archaeologist with a dust allergy to protect her ploy. Still, the writers quickly create a captivating mystery that takes the best of Agatha Christie’s setups by delivering plenty of crucial information and red herrings as a series of gruesome murders is revealed. As Mother Aurelia continues to shrug off the murders as accidents, she clearly draws Bernice’s suspicion, but the revelation that she is actually a renowned crime fiction writer looking for inspiration and ideas is an excellent subversion of expectations that plays to the unique tone of this series perfectly. This, of course, is the same universe of religious commercialisation as in ‘Brand Management,’ and so it doesn’t come as too much of a surprise that Bishop Synesius is looking to financially capitalise on the myth of the Talashanti Monastery as Nigel Lambert gives a great performance in a drunken and handsy role that could have so easily become a caricature. However, the true culprit manages to surprise everyone as that ultimate reveal in any mystery should, and the truth behind the Council of Ten and Celestion himself is another satisfying twist that points Bernice toward her ultimate goal. A comedic spin on Agatha Christie’s tales is not a novel concept by itself, even featuring prominently in the televised run of Doctor Who, but ‘Bad Habits’ is confidently written and performed and allows Bernice to face Professor Melville Trout who represents everything about archaeology that she disagrees with, effortlessly delivering a surprisingly enjoyable mystery even in the middle position of a more standalone set. ‘Paradise Frost’ by David Llewellyn closes out Road Trip as Berince and Ruth must take refuge inside the Xanadu Tower resort with their cab driver after being pulled off course to Kaff Zarnak, a world that was once a holiday destination of choice but that has since turned into a barren ice land spun off of its axis and ravaged by a lethal virus. Allying with the only survivors who offer any hope of understanding the past events and finding their way off this planet as food supplies continue to run perilously low and the dangerous sandroaches continue to attack at every turn, the mystery at the top of the tower quickly becomes their only hope. This desolate resort with frozen hot tubs and persistent music playing to a nonexistent audience is eerily evocative, and the human Doctor Carol Bauer and Killoran Yukon 9 provide a friendly pairing with a deeper understanding of events than they initially reveal which helps carry the tense mystery well and further reminds Bernice of the son whom she has been seeking for so long. India Fisher and Scott Arthur instantly make an impact alongside the leads, and Bauer’s frequent doting with the pet name darling along with Yukon’s poetic recitations to relieve stress as taught to him by his love hint at a meaningful relationship that of course is not quite as true as one party has been led to believe as becomes apparent with strong character work with the need to survive paramount above all else. With Bernice able to use her shrewd intelligence and attention to detail to see what others cannot, the eventual revelation that the Xanabix nutrition bars intended to increase worker productivity turned the occupants of this resort into the sandroaches that now run rampant due to its main ingredient is a suitably simple yet gruesome one that brings the entire story together satisfyingly. Given the lie about a virus that has been propagated to cover this tragedy and the true blame, there is no happy ending or twist to this tale, and Arthur Darvill gives an incredible performance late in the story as Doctor Jared Jones that is far removed from Rory Williams and proves his acting versatility. This is a conspiratorial mystery that succeeds with a depth and intrigue that the opening installment of the set couldn’t quite manage, providing an effective closure for Road Trip that leads into Legion well as Jones warns Bernice that what happens there makes the events of Kaff Zarnak look like child’s play. It’s a surprising move to make the second box set in a proclaimed new beginning for Bernice more of a placeholder and standalone one with continuity ready to take over in the next set, but the three stories presented are nonetheless perfectly enjoyable if ultimately less consequential than many that have come before, and the strong performances and direction help to highlight the variety so intrinsic to this range incredibly well.